If there's one thing I've learnt in the past few years of putting together these Christmas Gift Guides, it's that parents always shop for their littles (and children in general - even if they're 45 ;) ) before they shop for themselves - and that's why this year I thought I'd share our kids and toddler/baby gift guides before anything else! 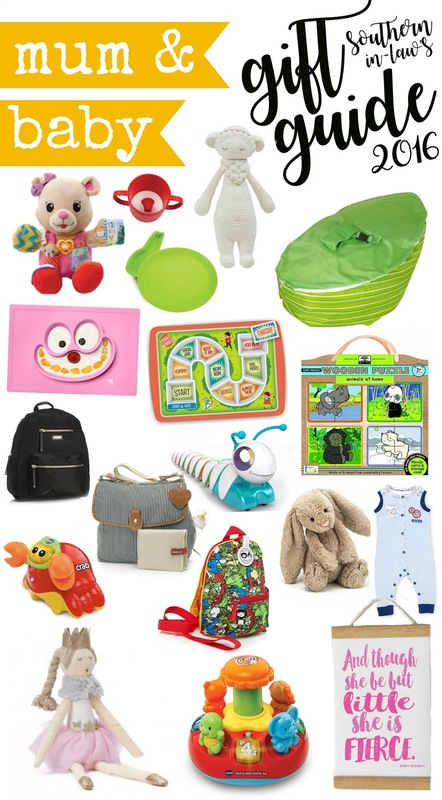 Here's our best picks for babies, toddlers and mum's-to-be this Christmas! Best for: Newborns and bubs to be as well as any child. The best bits: A perfect fit for any nursery, Poppy Sheep is a dream guardian who is the perfect addition to any family. Poppy has gorgeous gold accents and comes beautifully presented in a gift box making it the perfect gift for any mum-to-be or new arrival! The best bits: Princess Petal is a girl's best friend with her sparkly dancing shoes and tutu skirt. Be sure to check out the website link below to have a look at Nana Huchy's huge range of dolls - there really is something for everyone! The best bits: This bunny has to be the softest, cuddliest bunny available. It will be loved by any child and is almost guaranteed to become a favourite companion. These bunnies are now our go-to baby shower and newborn gift! You can't forget the one responsible for growing these tiny humans! These two bags are perfect for spoiling new Mums, Mums-to-Be or Mums of littles this Christmas! The best bits: One things most Dads I know complain about is that they're embarassed to carry a nappy bag because it's "too girly". This Charlie Backpack is chic but also "man approved". It comes with an insulated food and bottle bag, plenty of pockets and a wipe clean water-resistant interior in the larger pocket. The best bits: With a stroller strap and a handy concealed front storage compartment, this is a nappy bag that has some serious style. Available at: Online at Babymel or at selected stockists. The best bits: This plate is so fun you might be tempted to steal it for yourself. Tempting fussy eaters to get through dinner as they eat their way from the start to their hidden treat at the finish. The best bits: JJ Rabbit's range of biodegradable, phthalate, BPA and PVC free feeding pieces will be loved by all kids with their fun shapes. The CUPPIES Range encourages little eaters to finish their food/drink to reveal the animal underneath whilst the dipPLATE is perfect for little eaters who like everything separate - or who love to dunk their food into their favourite dip or sauce. All items are dishwasher friendly and microwave safe too! The best bits: Fun and practical, GizmoTots Placemats are perfect for all little eaters and stop bowls and plates from flying off the table as the placemat and plate/bowl is all in one! They're dishwasher safe and available in a bunch of fun designs! The best bits: Helping babies to learn cause and effect relationships, numbers, shapes, animals and sounds, the Push and Play Spinning Top will provide hours of fun as babies grow and learn. Available at: All major department stores and leading toy retailers. The best bits: Perfect for preschool, daycare or trips to the park the Zip and Zoe Mini Backpack comes in a range of fun prints - from Princesses and Dinosaurs to Spacemen and Floral Prints. Available at: Online at Babymel or selected stores. The best bits: Alice is cute, cuddly and provides lots of learning fun. She has a variety of different textures to enhance sensory development whilst her comments and songs promote recognition and accelerate learning. The best bits: The perfect way to add some extra fun to bath time, the Toot Toot Splash pals talk and play music as they float along. The best bits: Made with wood from sustainable forests, this puzzle contains 16 pieces specially designed to enhance learning skills. The puzzle is printed with vegetable inks and comes with a reusable carry case. The best bits: Designed to develop important skills like planning, sequencing and critical thinking, the Code-a-Pillar is a seriously cool toy that both kids and parents will love. Who for: Ages 0-5 ! The best bits: The brand new Thomas and Friends clothing range, created exclusively for Myer, is ridiculously cute and features everything from onesies and sleepwear to swimsuits, pinafores and casual outfits. Available at: Online or in-store at Myer. Who for: Ages 0 and up. The best bits: Designed specifically for newborns, Sleepy Beans Beanbags feature a harness which allows you to strap bub in when they're really little whilst also growing with them as you switch out the harness top for the straight top so toddlers and kids can have their own mini bean bag. But tell me, what's your go-to presents for expecting parents or new arrivals? And what was your "comfort toy" as a kid?